"Mrs Brooks and John Barrymore"
In Guess Who?, the host Happy Feldman plays clips from movies, speeches, and more as prods the guests to "Guess Who?" The host interviews each guest before quizzing them about the sound clips for Sheffield "silver coins." When they guess correctly, Happy drops the coins in empty milk bottles—clank! When the guests get the answer wrong, Happy sounds the cowbell. Guests include WWII service me on leave, housewives, farmers, and more charming everyday people. At times, Happy has a little trouble getting the guests to talk. At one point, he asks the guest the quiz question from the card and the guest gets it right after the clip is started. He said, "How did you guess that?" The guest replies "When you started to ask for it, you said Deanna." Guess Who? was sponsored by Sheffied Farms Dairy Products. 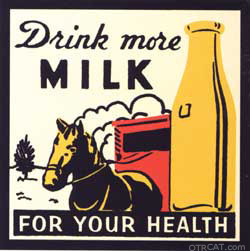 Advertisements are especially entertaining in which the announcer claims milk "makes you look younger" and "saves you money." For another great interview-quiz show see also Groucho Marx's You Bet Your Life and What's My Line. Be the first to comment on "Guess Who"